With the support of our skilled and experienced artisans, we have been able to serve our clients with a wide assortment of Hanging Lights. It is aesthetically designed using quality glass and is available in attractive patterns, designs & color combinations. Our Hanging Lights find application hotels, restaurants and showrooms. 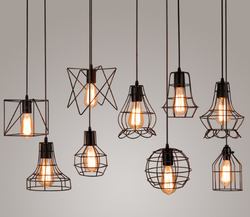 A pattern into the range of designer hanging Lights defining the decor of ravishing interiors and luxury living. Heritage structural and modern patterns. We are a topmost organization providing hanging light fixtures to our customers. These are made by our vendors by use of best grade material. These products are robust and are made as per the requirements of customers in order to fulfill their expectations. In addition to this we are providing these at nominal rates. We offer a variety of hangings in different styles and patterns to clients. These hangings are a perfect blend of ethnic as well as modern look. They perfectly match with any type of interiors to provide an amazing look to the place. We use brass/alimunium, glass and such other materials in the manufacturing of these products.